It’s about time to fire up the grill for the season and you’re going to want to add this Grilled Mahi Mahi Recipe to your regular grilling lineup! There are so many ways to eat your grilled Mahi Mahi – check out all of our Mahi Mahi Recipes for ideas! Don’t be intimidated by grilling fish on the grill – it’s much simpler than you probably imagine. This recipe will walk you through how to easily and successfully grill your Mahi Mahi fillets. I absolutely love Mahi Mahi because of its mild, almost neutral flavor. I will be the first to admit – I DO NOT like fishy tasting fish. I’m out when it comes to salmon, I can barely stomach tuna, but when it comes to Mahi Mahi I am down for that! So, if you’re someone who prefers a milder white fish, I think you’ll enjoy Mahi Mahi. It’s almost summer here, and I’m ready to fire up the grill. Grilling when it’s warm outside means less heat in the house and quick and easy recipes. So fire up the grill and let’s get cooking! Should I line my grill with foil before grilling Mahi Mahi fillets? The quick answer is no. 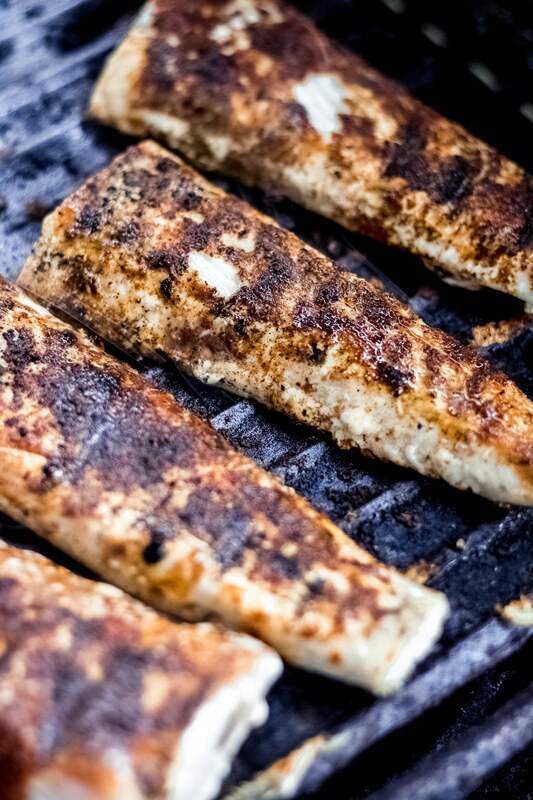 You do not have to line your grill with foil before grilling Mahi Mahi fillets. However, if you feel more comfortable lining your grill, or using a grill basket or pan, by all means, go ahead and grill how you feel comfortable. What temperature is considered done for Mahi Mahi? For Mahi Mahi, the internal temperature should be 137 degrees F. You can also ensure it’s done by using a fork to see if it flakes easily. Because it is a leaner fish, you want to make sure you don’t overcook the fillets because the end result will be very dry. How long will grilled Mahi Mahi stay fresh? I suggest eating any leftover fish within three to four days and be sure to properly store in the refrigerator inside an air-tight container. What temperature should I grill Mahi Mahi? Because you want to avoid overcooking the Mahi Mahi fillets, you’ll want to have your grill temperature at a nice medium heat – 350 degrees F for those that keep the actual temperature on their grill. Can I grill frozen Mahi Mahi fillets? Ideally, no, you’ll want to cook with thawed or fresh Mahi Mahi fillets. Brush each Mahi Mahi fillet with coconut oil, then rub the spice mixture over each fillet. Heat your grill to medium heat (350 degrees F) then place the fillets onto the grill. Grill for about 6 minutes on one side, then fli and grill for another 6 minutes. 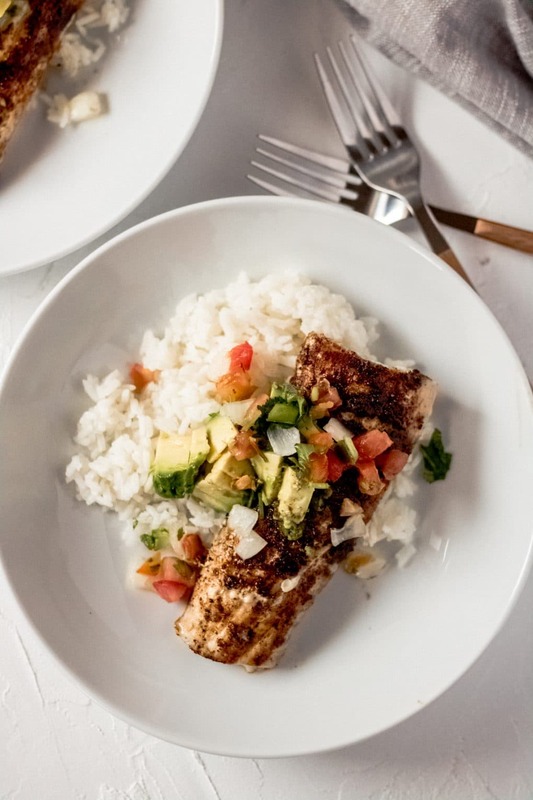 Check to see if the fish flakes or check the internal temperature to ensure they’ve reach at least 137 degrees F.
Once the fillets are done, remove from grill and prepare your grilled Mahi Mahi rice bowl. 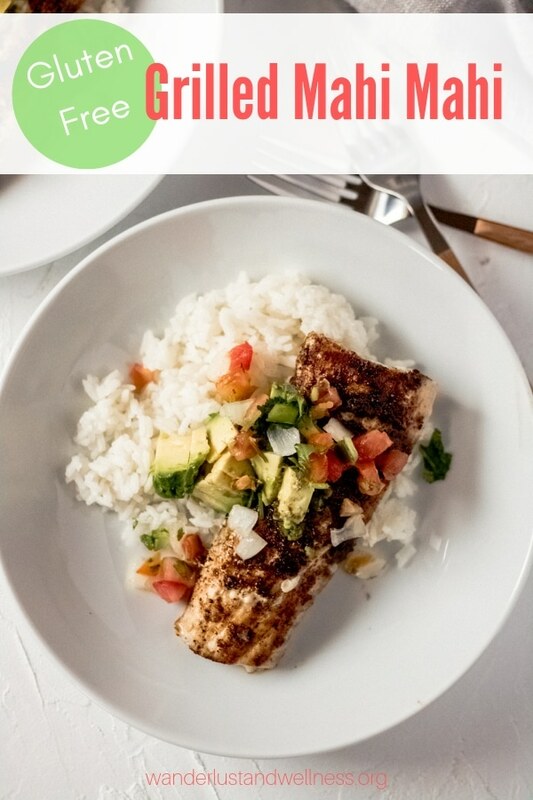 This grilled Mahi Mahi recipe is super easy, finishes in under 15 minutes, and is naturally gluten-free! Cook the rice ahead of time according to package directions. Preheat the grill using medium heat. In a small bowl, combine the dry spices: salt, pepper, cumin, smoked paprika, and chili powder. Mix well. 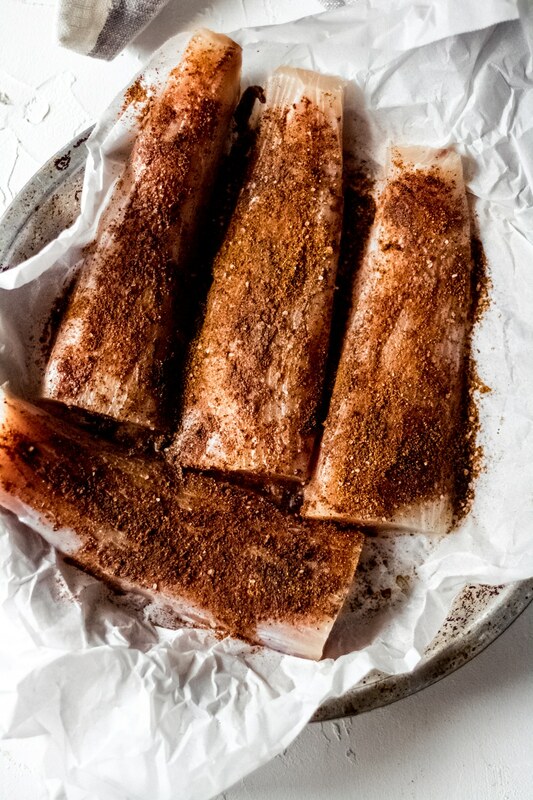 Brush each fillet with coconut oil and then season each fillet with the dry spice mixture. Using your fingers, pat the seasoning onto each fillet. Place the fillets onto the grill and grill for six minutes. Flip, and grill for another six minutes. Check the internal temperature or fork test to ensure the fish is white and flakes easily. 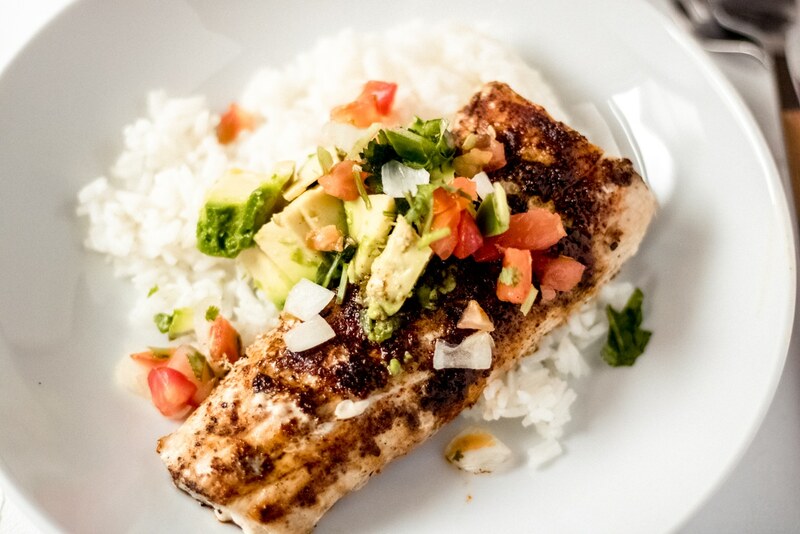 Remove from the grill and assemble your grilled Mahi Mahi rice bowls – add about 1/4 cup rice to a bowl, top with one grilled Mahi Mahi fillet, then top with sliced avocado, fresh pico de gallo, or other toppings of your choice. Fruit salsa would be another great topping for this recipe! 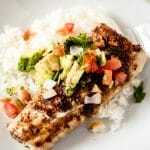 Try these other delicious Mahi Mahi recipes!